The home decking industry has been on the rise for years. When it comes to finding the right installer, you want to be certain the one you hire is reliable and experienced. At Ready Decks, we combine our top-of-the-line materials with our innovative, patent-pending building system. Contact us today and we’ll provide you with further details regarding Ready Decks products. At Ready Decks, we never take a “cookie-cutter” or “one-size-fits-all” approach. Since no two projects are the same, you can count on us to give yours the attention it deserves. Learn more about the various Ready Decks products below. This is a complete deck, pre-priced and custom-fit to your site. You can rest easy knowing that Ready Decks are constructed using premium grade, treated lumber. What customers really appreciate, though, is that most Ready Decks can be built in just one day. Wouldn’t it be nice to spend more time outside but not have to deal with the hot sun beating down on you and your guests? That dream becomes a reality when you opt for a Ready Porch. This product features premium metal roofing in multiple colors as well as treated beams, rafters, and lathes. Homeowners often ask us if a gable porch would look good on their property’s exterior. Keep in mind that a Gable Porch from Ready Decks can be built to match the existing dormer on your home. Be sure to ask about upgrades such as wagon wheel gable design and vinyl. 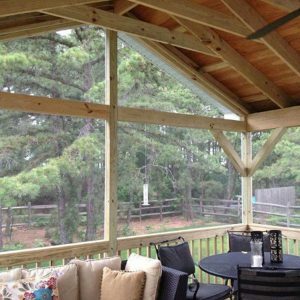 Thanks to our Screen Porch Systems, you and your guests can enjoy unbroken views of up to 16 feet. No longer will insects and pests dictate the time of year you can spend outdoors. Screen Porch Systems from Ready Decks include one standard wood screen door, as well as the option of a treated tongue and groove floorboards as an upgrade. Is your current pool deck no longer functional? Whether your pool is above-ground or in-ground, Ready Decks will customize a deck to fit its exact curve. Product features include a self-supported design for stability, up to six steps to meet the extra height to accommodate your pool, as well as full baluster rails and handrails. As a homeowner or business owner, you want your space to be accessible to anyone. This is where wheelchair ramps from Ready Decks come into play. Not only are these products built to meet ADA guidelines, but they’re also certified by other agencies for use in projects and evacuation zones. We’re willing to bet you rely on your vehicle almost every day. So wouldn’t it make sense to invest in a little more protection for your car or truck? Ready Decks can easily build a carport on your home to keep your ride safe and out of the elements. We should also mention our team uses the absolute best in treated lumber and metal roofing materials. Perhaps you need stairs for a home or business but don’t know where to start. We encourage you to ask about custom-design, site-built Ready Steps from Ready Decks. Ready Steps will solve your structure’s accessibility issues without costing you an arm and a leg. Similar to decks, pergolas are also gaining traction among homeowners. A pergola can serve as an extension of a building or as protection for an open terrace. If you’re looking to do something different with your property’s exterior, a pergola is a great place to start. Ready Decks is not just another deck company. For nearly two decades, we have provided homeowners with beautiful, functional, and affordable decks in as little as one day. Regardless of the product you purchase, you can count on Ready Decks for a stress-free consumer experience. As aforementioned, our deck builder never settles for anything less than the best materials. For one thing, our decking boards are handpicked at the sawmill. On top of that, the Ready Decks team uses ACQ-approved rink-shank fasteners for durability purposes. Then there’s the value aspect. Sure, you might be fairly limited in terms of your deck budget. But that doesn’t mean the product you choose shouldn’t provide value. At Ready Decks, longevity is a major point of emphasis. Whether you select a Ready Deck, Ready Porch, or something different, you can expect your product to last for years to come. With Ready Decks, you never have to worry about being rushed through the process. We understand you probably don’t have all the answers yet yourself, which is why were are here every step of the way. Not only will our staff educate you further about our unique products, but we are more than happy to answer any questions you may have. Experience the Ready Decks difference and contact our team today!